By Daniel Horowitz & Taali Lester Tollman--With the Schwartz/Reisman Centre on York Region’s Joseph and Wolf Lebovic Jewish Community Campus set to open, excitement is building up north like never before. For months, community members have been watching with great anticipation as the building was under construction, keeping track of all the special facilities the Centre will offer. Even though its doors don’t open until June 1st, registration has already soared to 40% above projections with over 2,100 members signed up and ready to go, demonstrating that the need for the programs and services provided by the Schwartz/Reisman Centre is stronger than ever. The Lebovic Campus location of the Jack & Pat Kay Centre Camp has already reached its original target of 250 campers, with sales still going strong. Meanwhile, the Gorman Shore Goodman Childhood Education Centre, which opens in September, is already 75 percent full. It is difficult not to be awestruck when entering the Centre. The beautifully designed building emerges seamlessly from the ground up, melding perfectly into the landscape. Once inside, members will immediately feel welcome and at home. The Phil Granovsky Sports & Recreation Pavilion is home to the salt water Brown/Lederman Outdoor Pool and two indoor salt water pools, including the Jacob’sLadder Therapeutic Pool. 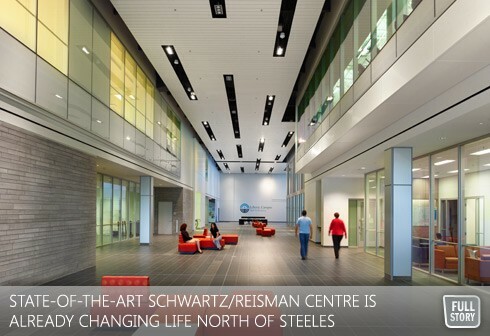 “Years in the making, the Schwartz/Reisman Centre on the Lebovic Campus is finally getting ready to open its doors – and its arms - to the residents of York Region,” said Ted Sokolsky, President & CEO, UJA Federation of Greater Toronto. “Life north of Steeles Avenue will never be the same again, as so many of the services and programs needed to live full, healthy and happy Jewish lives will all be available under one roof. Registration is already higher than we ever anticipated, and the opening is still a week away.